I’ve been making kimchi now for over two years. I’d say that about 90% of the people who have tasted my kimchi have found the heat level to be perfect. But I have yet to win over that last 10%, who feel it could be hotter. The problem isn’t easily solved. Adding more Korean red pepper flakes does not increase the heat much. And if you add too much, not only is it not that spicy, but it can irritate your stomach. What I needed was a second spice to assist the Korean Red Pepper flakes. First I tried the basic dried red pepper used often in Italian restaurants. It increased the heat, but dominated the flavor. Then I tried Thai chili peppers. Although it added some heat, the taste clashed with the other ingredients. I needed another source of heat. In September, I developed a spicy sauerkraut recipe called Ghost Pepper Sauerkraut. 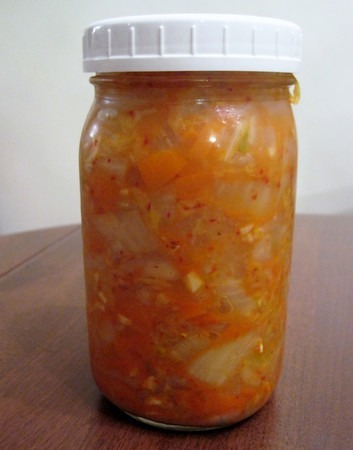 If ghost peppers worked for regular sauerkraut, then it was worth trying for kimchi. Last week I tested it out and I love it. When you first bite into Ghost Pepper Kimchi, you taste the Korean red pepper and then slowly the ghost pepper chili sneaks up at the end and adds a wave of heat. Snap! Warning: It May Be Too Hot! I’ve made this recipe three times. It may be too hot. The last batch I made was so intense, I needed to cut it with rice. What I discovered is that the heat level is controlled by the ginger. The more ginger, the more muted the heat. So my advice for creating a hot kimchi is to first reduce the amount of ginger before increasing the ghost peppers. Chop up cabbage to the size pieces you wish to eat. Add Sea Salt to cabbage and rub in by hand. Add chopped garlic, ginger and dakon. Mix in Korean Red Pepper Flakes. Culinary tradition: Korean + Seattle! 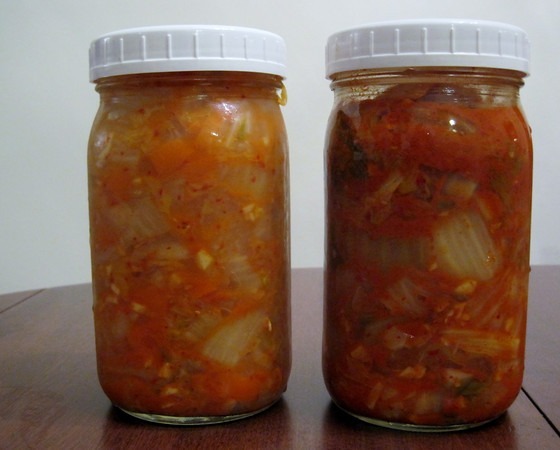 Ghost Pepper Kimchi (left) has less Korean Red Pepper flakes than regular Kimchi (right) and a more orange color. …my CSA. There’s kimchi in my weekend plans for sure. No ghost peppers to be found here, but I might drop a habanero into the mix. Have you ever added fruit to your ferments, MAS? I tried a couple of batch of kimchi with apple went uneaten because the fruit went alcoholic (smelled like cider), then turned blue. I suspect the “bad batch” wasn’t sufficiently submered in the liquid but I’m not sure what else might have intervened. My all-veggie ferments haven’t had that problem. In a few months we will be selling our Kimchi on-line for those of you who aren’t as adventuresome as some to actually take on the crazy task of making it yourself. Mrs. Kim has been making delicious Kimchi all her life and my brother and I thought we’d share our joy with Americans. Her brand will be called Kimchi Green. Follow us on Facebook, just search Kimchi Green. Thanks! Hey! I just came across your site via biohacks.net. As a fellow Seattleite, I was wondering where you purchase your kimchi ingredients? Uwajimaya? I’m relatively new still and am learning my way around. Thanks for the info! @Tyler – Uwajimaya is fine. If you can get to the Korean grocery stores, even better. Bo Han (Edmonds) or H Mart (Lynnwood or Federal Way) should all have the Korean red pepper flakes. Central Market (Shoreline) and Ballard Market have them as well. Other ingredients are found everywhere.